This is how our summer is going: on Tuesday, June 29, we returned home from our Kentucky trip. On Saturday, July 3, we left again for a week-long road trip to New England. Our first stop was Clem's Cafe in Blairsville, Pennsylvania, for some of the better barbecue around these parts. This was the first time I had been to their new location, and my assumptions had changed a bit as well. On my last trip, I had assumed that they smoked their barbecue; since then, I've realized that there are a lot of folks in western Pennsylvania for whom "barbecue" means high-heat grilling over a wood fire. Was Clem's really smoking, or were they grilling instead? Now that I knew enough to ask the question, the answer was obvious: they're cooking over a large grill, with flames leaping up past the grill at times. Inside, the restaurant smells like barbecue. My memory of the previous location was that it did not have any particular smell, so this was a pleasant improvement. I asked the young woman behind the counter what the sausage was like, and got an uninformative answer, so I decided to try it. 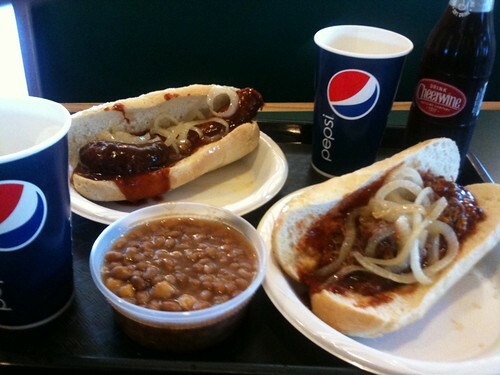 Answer: it was sweet Italian sausage, which didn't quite match Clem's barbecue sauce. Lori's pulled pork sandwich was a much better match for the dark, rich sauce. We noticed Cheerwine in the drinks case, so gave that a try. It reminded me of the fruity flavors of Dr Pepper.